Siberian Fastfood will take part in the newcomer radio show "Netzparade" on radio "DASDING" starting tonight. The show will be on air 8pm-10pm today. Help and vote for us! When we collect enough votes, we will be put into the top 15 charts and played again next week. In the menu on the left, click on "Netzparade". 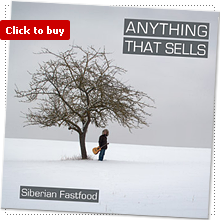 To vote for us, click the checkbox next to Siberian Fastfood in the list. Overall you have to vote for 3 bands from the "Neuvorstellungen" and the Top 15 ranking. You can't vote for more or less than 3 bands. After you selected 3 bands, scroll down to the bottom and click on the button "Abstimmen". You can vote only once per week from the same computer/IP address.